The news from the front or at least Paul’s Parents place was warm weather, clear skies and no swell to be seen, almost unbelievable considering the grey overcast weather we were having in Perth, but true enough as we drove South the weather improved and the knotted hankies, rolled up trousers and a craving for fish’n’chip appeared as we arrived at Seahouses. Arriving early gave us the chance to meet up and have a natter and move the kit to the winches in good time to load the boat for a 14:30 ropes off. We were on Glad Tidings VII today, one of the larger dive boats with a tail lift, absolute luxury, though the facilities below decks were basic. 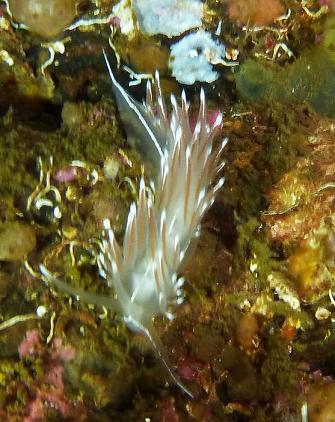 The first dive of the day was the Somali, a slack water dive and today at low water, lying at 26m. The boat crew placed a shot which landed towards the stern and we all slid down it to accomplish various circuits of different lengths dependant on our air consumption. 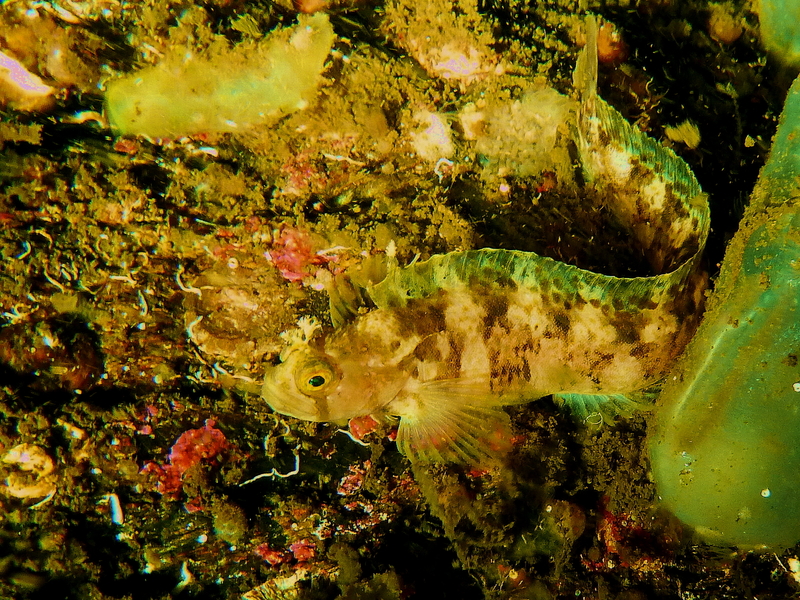 Fred and I did an out and back plan, finding twisted metal and a few friendly wrasse. Having seen some of the wreck we re-ascended the shot to be picked up by the boat, quickly followed by the appearance of various DSMB’s. All back on board we were supplied with tea or coffee and we steamed across to the Farne Islands, past Staple Island and under the Longstone light to spend a pleasant surface interval watching seals. Aware of the time we jumped in for the second dive on a set of gullies and landed in lobster city, clearly the benefit of not over fishing and a no-take policy. (Seahouses has a no landing policy). 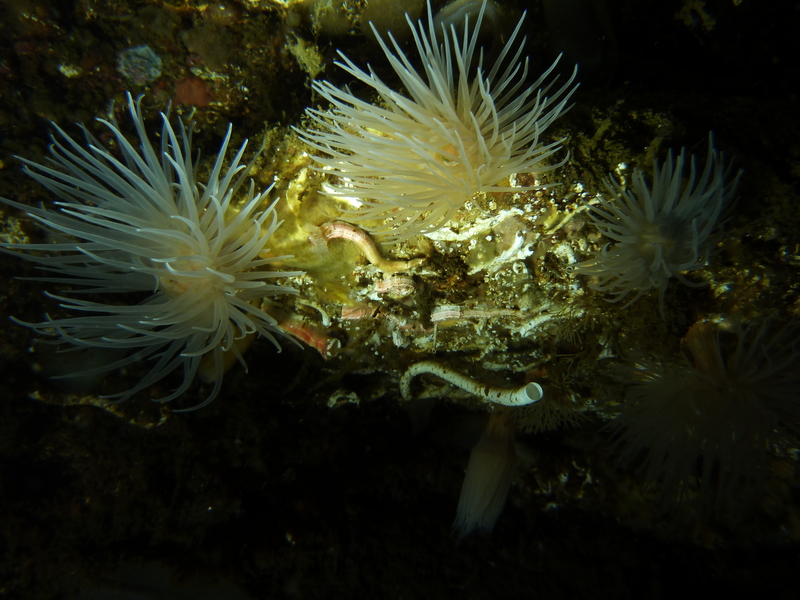 The dive drifted gently along life encrusted walls and sandy gullies where the seals came to investigate strange bubbling animals before gliding effortlessly off into the gloom. Superb. The trip across to the west coast is always a pleasure, especially when the hills are lit by glorious early morning sunshine. Sunday however saw the weather gradually deteriorated until we arrived at the Argyll Caravan Parkto be greeted by Izzy and Gary in their high vis ‘yellas‘ and drizzle. 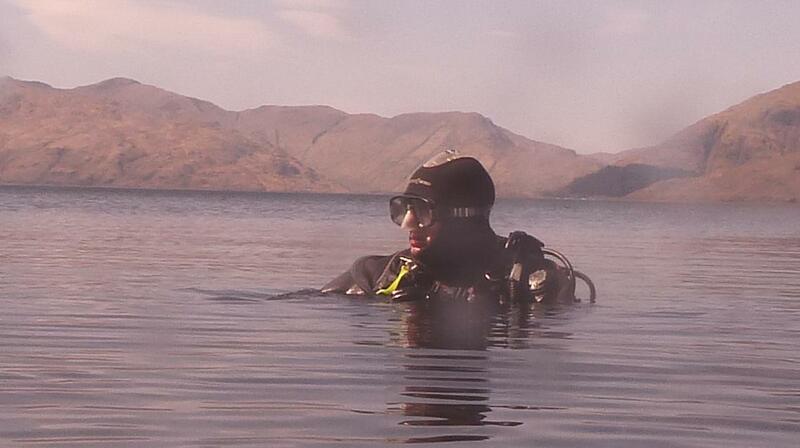 Such are the joys of diving in Scotland. After an easy launch, we headed down Loch Fyne past Kenmore point to Stallion Rock which lies off Pennymore Point with Mo at the helm. 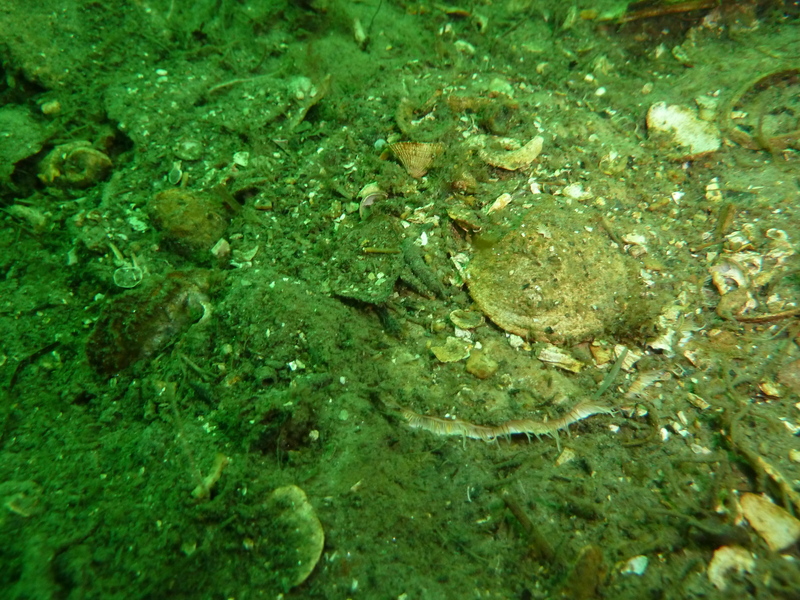 Here, we spent a few minutes searching until Gary spotted it, a great grey whale back just below the surface and an impressive drop showing on the echo sounder on the loch side. Izzy and Bethan were first in followed by Mo and Chris while Paul and Gary manned the boat. The site itself was superb, a few small sandy shelves leading in 10m or so to … the drop. 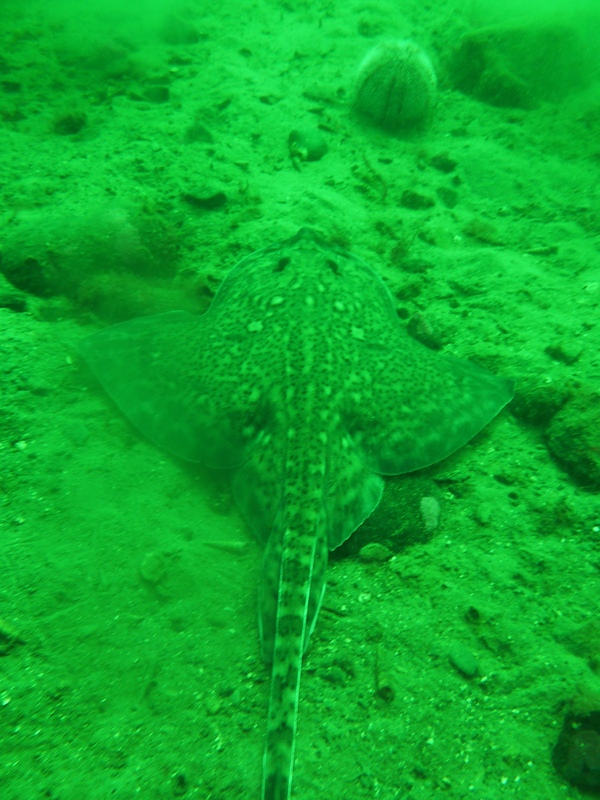 With the overcast skies and light starting to fade at the 25m mark there was still a good void beneath your fins as you were carried gently southwards along the wall. 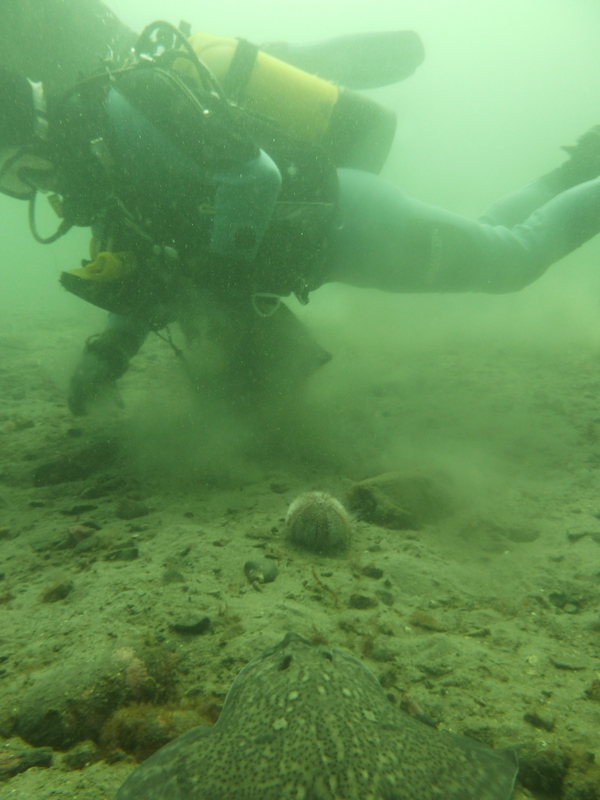 We learnt quickly to take great care not to swim too close to the wall and disturb the sediment that rested upon it as it then followed you in the current impairing the viz. Izzy and Bethan disappeared into the depths to explore dark places and find the undercut while Mo and I enjoyed a very pleasant drift in the light. We found some interesting life such as this Yarrell’s Bleney that was moving snake-like across the wall. 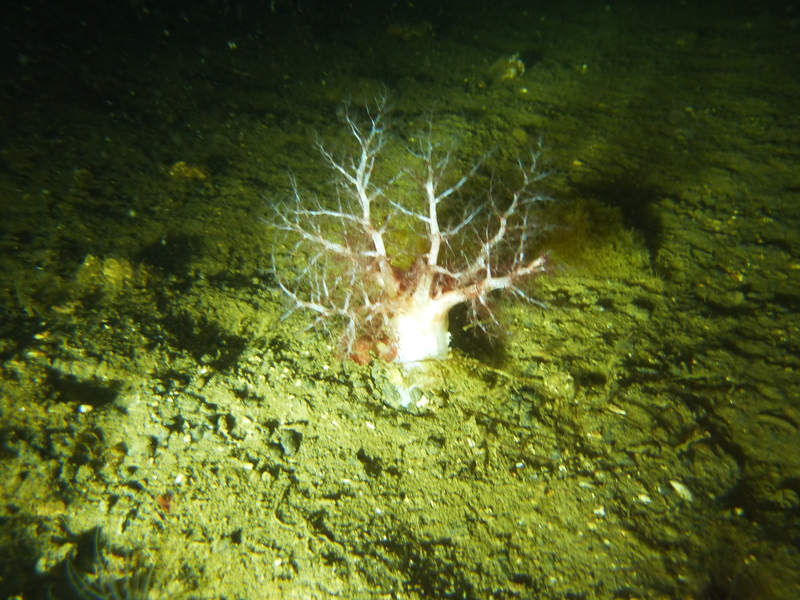 After passing some enormous sponges and clusters of sea loch anenomies we made our ascent as we had started getting cold, finding a couple of nudibranchs (Flabellina lineate) as we did so. 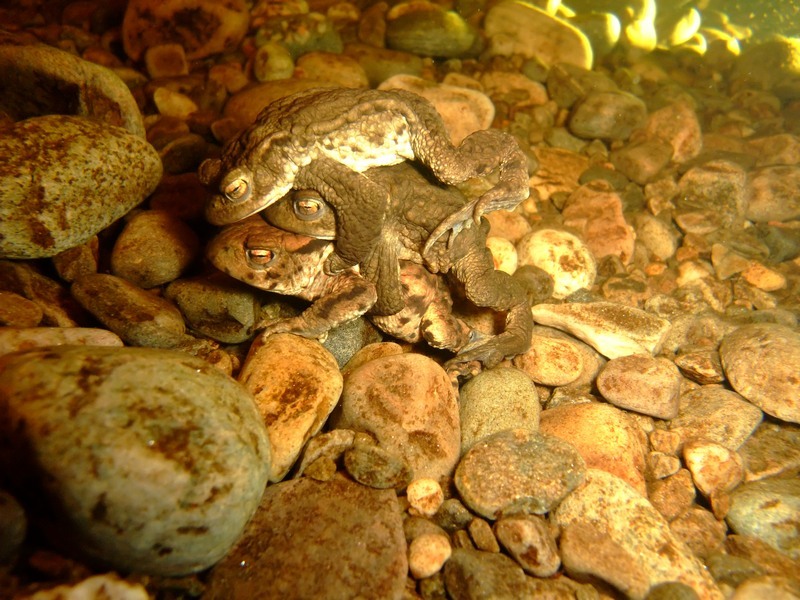 With the first wave of divers recovered, Gary and Paul rolled in and reported a red carpet affair with flash guns and spot lights illuminating the stars as they drifted by under the undercut. Lunch ! Yes but where? 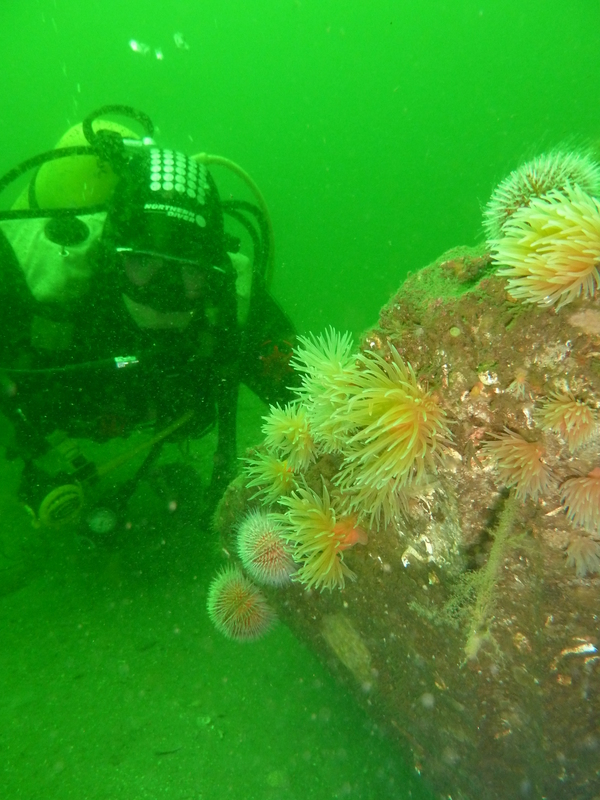 In the drizzle we decided that the Furnace tea-room was a great option being en route to the Minard Islands so with Gary at the helm we cruised down to anchor in the bay taking care not to damage any training divers. As it turned out there were none at all on the reef today? Having dutifully enquired if they minded, we all sat next to the door enjoying tea and chocolate cake, though I did think that Izzy had an unfairly large slice ! 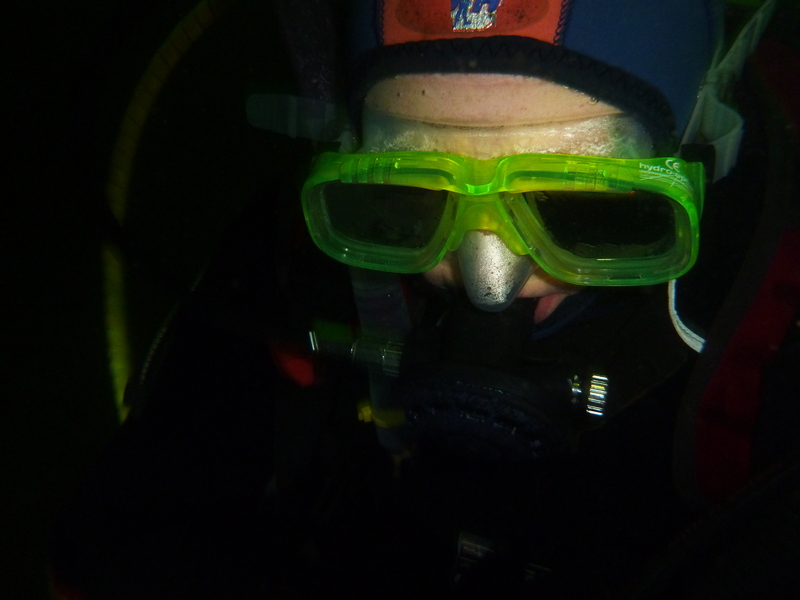 After lunch, back in the boat, the tanks swapped over and the first wave was kitted up, Paul helmed us down to Eilean Aoghainn, the largest of the Minard Islands. Mo and I went in first in Coalas nan Each-uisage, the bay on the East side, enticed by kelpies and the promise of giant scallops. 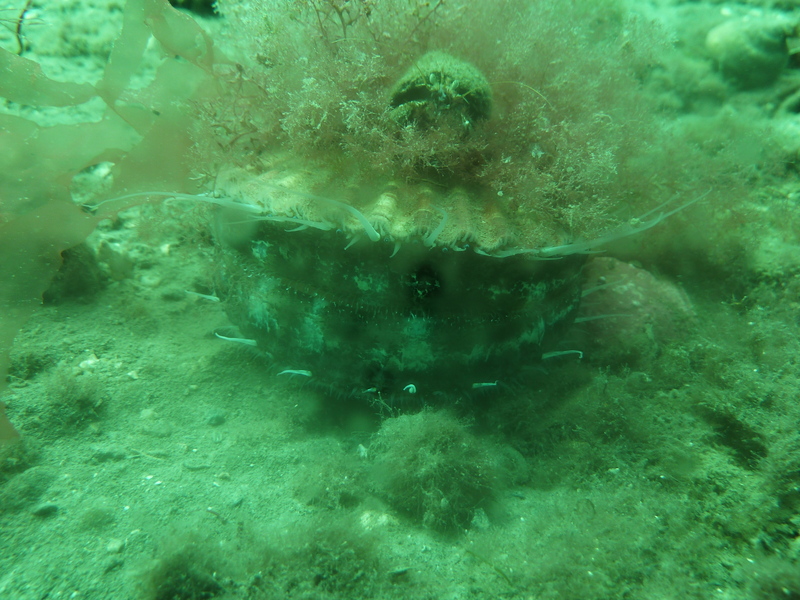 Good vis but not a great deal to see save some sea cucumbers, though the light and life was much better in the shallows over gravel and shell beds where there was an abundance of small colourful life. 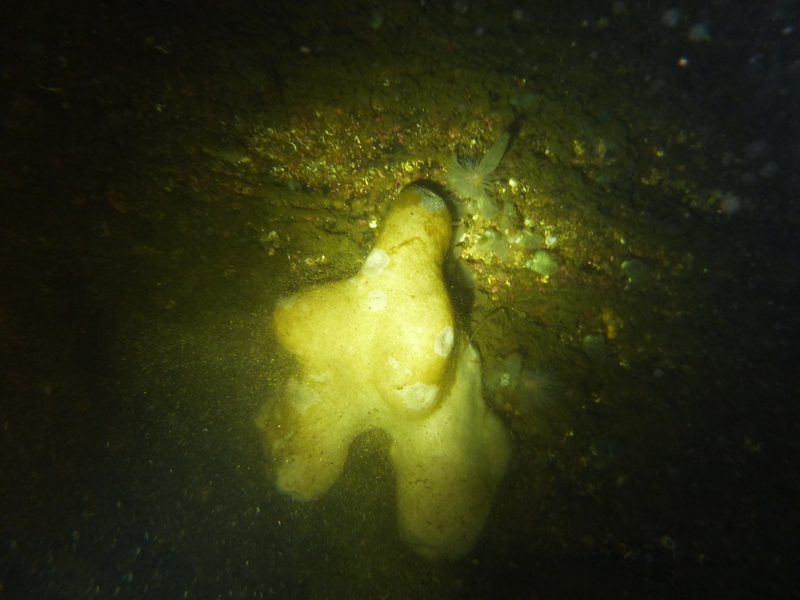 Izzy and Bethan followed on a similar dive while Paul and Gary did the steps at the SE tip reporting another good drift along walls encrusted with sponges and Dead Man’s fingers. With all divers recovered, Bethan took the helm and drove the boat back, passing an exposed Stallion rock and apart from the challenge of a low water recovery of the boat which required an extra long length of rope all went very smoothly. 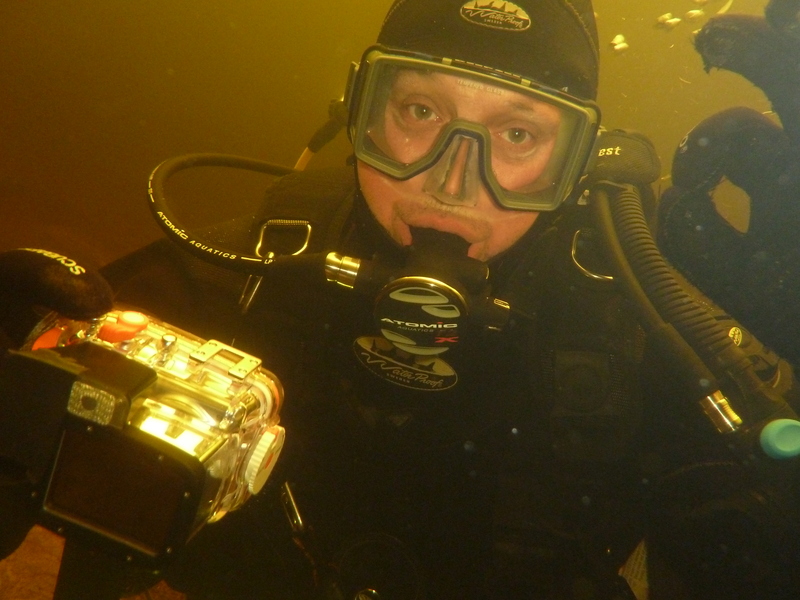 Yet another successful and highly enjoyable day of club diving albeit in some rather ‘damp’ weather. Site 1: Stallion rock, Pennymore Point, Furnace Loch Fyne. Site 2: Coalas nan Each-uisge, Eilean Aoghainn, Minard Islands, Loch Fyne. Site 3: SW tip, The Steps, Eilean Aoghainn, Minard Islands, Loch Fyne.